This dish was created for the Campbell’s Soup (Hong Kong) website. I feel honoured to be invited to create recipes for their products. 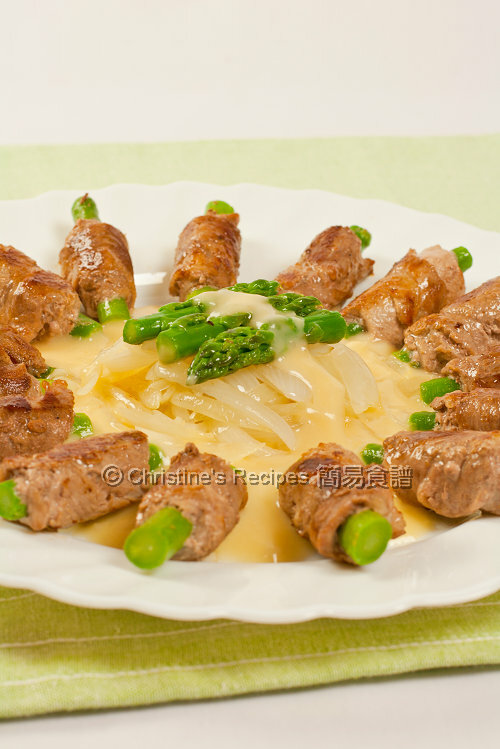 The original recipe of this dish, Pork Rolls with Creamy Onion Sauce was written in Chinese. Upon receiving good feedbacks from my fans who tried this recipe, I decided to translate it into English to share with my English reading readers. Hope you’d like it. 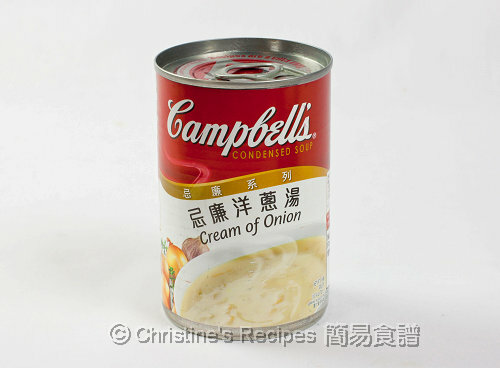 If you’re not living in Hong Kong and can’t easily find the Hong Kong Campbell’s onion soup, you might replace it with any other creamy soup to your liking that comes in handy for you. Take an example, this Cream of Chicken, Campbell’s soup (Australia) is also a good choice for cooking this dish. This dish was especially designed for Winter Solstice (冬至), a traditional Chinese festival, that normally falls on 22 December every year. So when I plated up the dish, I used a round shape represents “fulfillment” and “achievement”, much like the symbolic meaning of eating glutinous rice dumplings (湯圓Tang Yuan) on that day. Blanch asparagus in salted boiling water for 2 to 3 minutes. (Note: Don’t overcook them. Let them remain crunchy.) Remove and immediately soak in cold water. When they cool down completely, drain well. Wipe dry with kitchen papers. Cut each into 4 sections, about 6cm long. You should get 20 sections totally. Use a small sauce pan. Add soup and water. Mix well. Bring it to a boil. Turn off the heat. Set aside. Roll asparagus with pork, one by one, with seams facing downward. You might like to secure each with a toothpick. Season with salt and pepper. Heat oil in a frying pan. Add onion and garlic, sauté until onion becomes translucent. Transfer onion in the soup mixture. Stir well. Set aside. Add some more oil in the pan. Carefully arrange pork rolls in one single layer, with seams onto the pan first. Cook over medium-high heat for about 2 minutes. Turn the other side and continue to cook until lightly brown. Sprinkle wine. When the pork is cooked through, dish up. Arrange the pork rolls onto a serving plate in a circle, or any pattern you like. Ladle soup mixture in the middle. Top with asparagus for garnish. Serve immediately. I used the pork for BBQ bought from a Korean shop. They are already cut into thin slices, very handy to use. If you can’t find any thinly sliced pork, you might ask your butcher to help you. Cook the seams of the pork rolls first. Then they won’t be broken apart easily. If you secure the rolls with toothpicks, remember to remove the toothpicks before serving for the sake of safety. By soaking the blanched asparagus into cold water, you stop the cooking inside and keep the bright green colour, even after frying with the pork. Lovely platter; i will admit to never buying Campbell products (too salty) but this is very appealing. No, the one I used is not too salty. Instead, it's creamy and full of flavours. Believe me. They didn't pay me to say and write this post. Fits a five-star restaurant dish! Great chef level! this dish looks like serving in 5 star restaurant, so delicious and well presentation. Not had any Campbell for so long. So this onion is not too salty? Yup, I'm very satisfied with the taste of Hong Kong version. I didn't need to add more water to dilute the soup mix. The taste is natural and balanced. This is something you usually see in a hotel restaurant or in a fine dining room. Great job! looks so inviting with the onion cream and thanks for the tips on soaking the asparagus. Christine!! I am so impressed that Campbell's asked you to make a recipe for them... do you know that I LOVE their soups? Especially the mushroom... never tried the onion but am sure it would be fantastic - it already sounds like my type... and because they've asked you to create this dish - I know it will be wonderful! Mushroom would work too right? You're absolutely right. This recipe works for mushroom too. definitely yummy! I've never used Campbell's soups this way..thanks for the great idea!